Rosary Records Loved One’s Heartbeat #WearableWednesday « Adafruit Industries – Makers, hackers, artists, designers and engineers! I had to look twice when I discovered this wearables project by Jasmine Calderon — it’s a rosary with the ability to record a heartbeat and store it. Then, when the loved one passes away, you have the ability to play the hearbeat. It all works with an Arduino Pro Mini, a heart sensor, vibration motor and pressure sensor. I’ve seen other uses of heart sensors before, but I believe this one has the most sentimental value. Jasmine talks about the connection to her work and of the importance of religion in culture. I explored this project from the viewpoint of a Mexican-American Catholic, looking at rosaries as a tool used for prayer and achieving comfort. A change in behavior could emerge from a product that captures the heartbeat of a dying individual. No longer is a rosary only seen as a tool for prayer, but an extension of a person’s identity after they have already deceased. 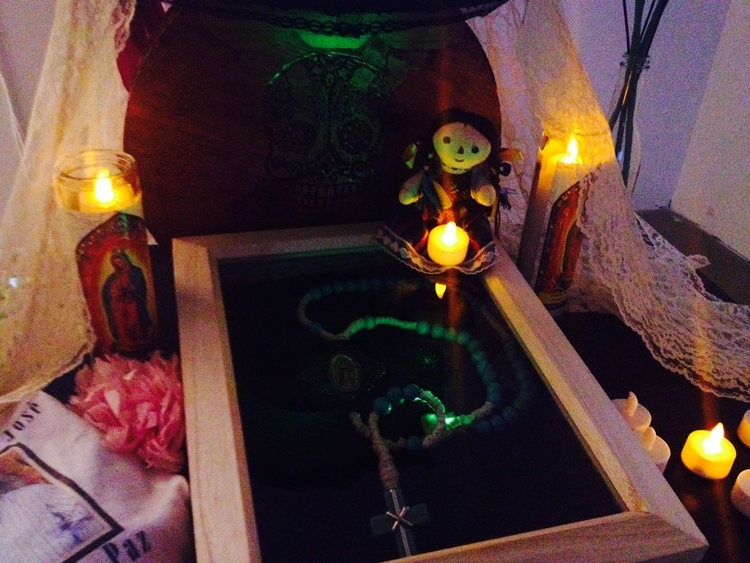 It’s use then becomes relative to Mexican culture by praying with it during Dia de los Muertos, a Mexican holiday which honors its ancestors and the cycle of life. Some people shy away from hacking religious objects, and I understand protecting years of tradition. However, Jasmine’s intent is so honest and heartfelt, that it just seems like a nice blend of technology and respect. I know when I visit church with my in-laws that I smile whenever I see the electric votive candles. Who would have ever thought that a real flame would become an LED. However, with the cost of insurance and the threat of fire ruining beautiful stained glass windows, it makes perfect sense. Perhaps technology is becoming a protector of history, whether it be memories or buildings. While I don’t want to get you into trouble with your grandmother and her favorite rosary, I can point out that we have some fun ways to look at heartbeat, like our Heart Rate Badge tutorial. So, just know there is another way to explore this idea of life and celebration. Let us know what you build. It’s a tremendous honor to have been apart of Adafruit’s blog. Thanks so much!